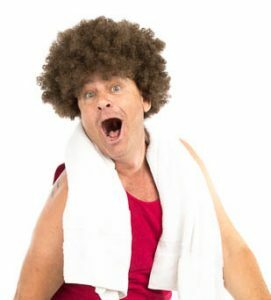 Just off his tenth consecutive cruise with thousands of his closest friends, Richard arrives in his trade-mark shorts and tank top ready to sweat with his newest success story. Once located he tells the audience of this special individuals struggles, so overwhelming it nearly brings Richard to tears. So touching is the story he had to tell his friends Liza and The Devine Bette, who have inspired him to produce a new work-out tape called “Sweatin’ to Showtunes”. Thank goodness he brought a copy of the cassette of music so that his newest friend can help with the aerobic dancing and sing along. Richard than produces a complimentary “Deal Your Meal” to keep his friend on the right track along with a special hat and horn to celebrate all they have accomplished, which is identified when your telegram message is read and given to the recipient. *Character pictured not necessarily the same performer for all telegrams. We reserve the right to use a messenger in your area. We service most Northern California cities including: Alameda, Alamo, Albany, Antioch, Atherton, Belmont, Belvedere, Benicia, Berkeley, Brisbane, Broadmore, Burlingame, Campbell, Castro Valley, Claremont, Colma, Concord, Corte Madera, Cupertino, Daly City, Danville, Dublin, El Cerrito, El Sobrante, Emeryville, Foster City, Fremont, Hayward, Hercules, Hillsdale, Kensington, Kentfield, Lafayette, Larkspur, Los Altos, Los Gatos, Marin, Martinez, Menlo Park, Millbrae, Mill Valley, Milpitas, Montclair, Moraga, Mountain View, Newark, Novato, Oakland, Orinda, Pacheco, Pacifica, Palo Alto, Piedmont, Pinole, Pleasant Hill, Pleasanton, Redwood City, Richmond, Ross, San Anselmo, San Bruno, San Carlos, San Francisco, San Jose,San Leandro, San Lorenzo, San Mateo, San Pablo, San Rafael, San Ramon, Santa Clara, Saratoga, Sausalito, South San Francisco, Stanford, Sunnyvale, Tiburon, Union City, Vallejo, Walnut Creek, Woodside.